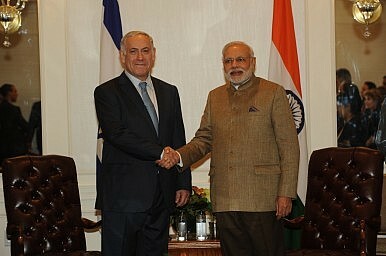 What does Israel have to gain from closer ties with New Delhi? While India began to drift towards Israel in the wake of the Kargil crisis, the elections of the Modi and Netanyahu governments have undoubtedly provided a new ideological foundation for the relationship, even if the practical implications of this foundation remain difficult to sort out. India and Israel have established a strong technology relationship, and Israel’s arms transfers to India continue to expand. In political terms, Modi’s India seems altogether less enthusiastic about supporting the international consensus on Israel’s behavior towards Gaza, although it would be difficult to construe India’s position as supportive. And to be sure, India has taken pains to maintain its independence. It continues to conduct cordial relations with Iran, for example, despite the ongoing Cold War between Israel and the Islamic Republic. But apart from the specifics of the India-Israel relationship, India plays an important role in Israel’s broader diplomatic strategy. In short, building a bridge with India, a country that no longer seems to care very much about the Israel-Palestine dispute, helps to insulate Jerusalem from European and American criticism. As with the effort to build good relationships with China and Russia, the Israeli effort in India (beyond its specific benefits) hopes to take advantage of the fact that most Asian countries have no direct interest in the Israeli-Palestinian dispute. India is particularly valuable in this regard because of its history of non-alignment and anti-colonial activism. Key to the Israeli argument is that it has become clear that the Israel-Palestine dispute is peripheral to the key military and strategic development in the Middle East. Although Palestine remains an important talking point for many regional players, Iran, Saudi Arabia, ISIS, Turkey, Egypt, and the rump Syrian government all have more important things to worry about than the plight of the Palestinians. This is an argument that Israelis have made for some time, and of course it serves Israeli interests to make it. But at the moment it has the benefit of being largely inarguable, given events in Syria and Iraq. At the same time, the tight relationship that Israel cultivated with the United States has come into question. The Obama administration has witnessed a more open (often bitter) dispute between the two countries than has been seen in some time. Europe remains (from an Israeli point of view) difficult and intransigent. Israeli strategy is not to replace the United States; neither Russia, China, or India can do that. But the courtship of India and other Asian states provides a diplomatic form of “strategic depth,” or breathing room. Of course, there is also danger for Israel in embracing this moment in order to avoid dealing with the problem of the Occupation. The situation may shift to Israel’s detriment in a variety of ways in the medium-term. The return of Congress to power in India won’t kill India-Israel ties, but it would remove some of their ideological foundation. If the war in Syria ends with the establishment of a radical Sunni regime that could make common cause with radical Palestinian groups, Israel will have a major problem. Similarly, the collapse of the Hashemite Kingdom in Jordan, or the Sisi regime in Egypt, could make Israel’s situation very difficult if it has not taken positive steps to find a new equilibrium with the Occupied Territories. In short, Israelis should be deeply wary of the idea that the current advantageous situation will give them the luxury of doing nothing. But the idea of building strong bridges to India, China, and the other states of the Asia-Pacific makes good long and short term sense for Israel.